Ceci est une maison exceptionnelle avec des finitions de qualité partout. Il a beaucoup de touches historiques, avec un porche couvert, deux ponts - une au large de la chambre principale, vue sur la rivière et le pont, véranda, tuile et granit. La maison est située à seulement quelques pâtés de maisons de la maison Goonie et de l'école maternelle de la police et à deux maisons de la maison Free Willy. Marchez le long du fleuve Astoria jusqu'au bassin d'amarrage est pour voir les lions de mer jouer pendant que les navires passent sur le fleuve Columbia. Ou bien prenez le tramway le long de la rivière et profitez des sites touristiques tout en écoutant le récit historique de la région présenté par le conducteur du tramway. Visitez le Columbia Maritime Museum, de renommée nationale, à Fort. Clatsop, Ft. Stevens et l'océan Pacifique. La colonne d'Astor est incontournable et offre une vue à 360 degrés sur le fleuve, la ville et les montagnes en contrebas. Astoria compte de nombreux restaurants servant du poisson frais, des microbrasseries et des antiquaires pour votre plus grand plaisir. Veuillez noter que nous ne faisons pas de location à court terme - seulement une fois par mois ou plus. distance de la rivière Columbia marche. écouter les lions de mer aboyer votre accueil! Very nice. Comfortable. Had a great time. Cozy, clean home with great view from upper balcony which is on second floor with second bedroom and bath. Lower balcony very spacious with picnic table and grill. Lovely layout on first floor with everything provided for a comfortable stay. Convenient location - Short walk to Safeway, Columbia River and Trolley stop. We loved our stay and would return! 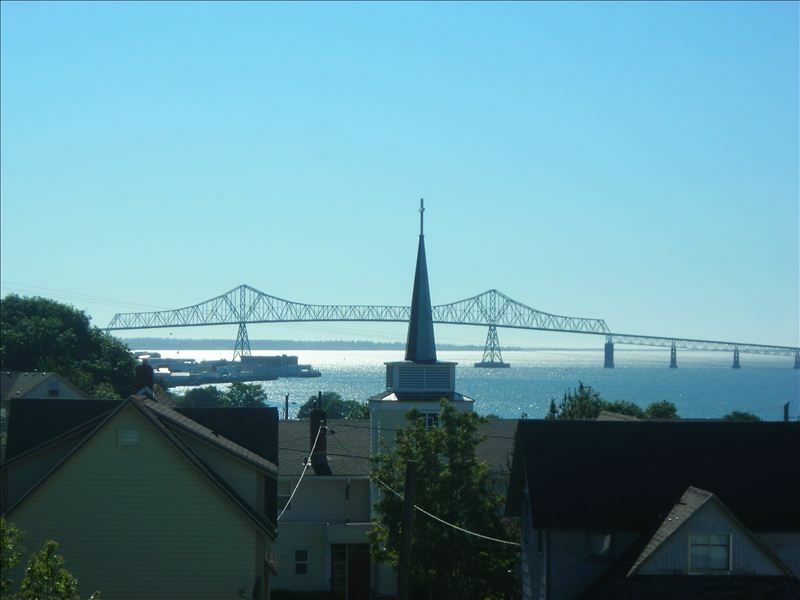 We are happy to share our home, and so glad you enjoyed visiting Astoria! This house is in a great location and in a very charming neighborhood. Astoria has beautiful Victorian and Craftsman homes well over a hundred years old. Owner has done a great job of remodeling and maintaining. We appreciate the prompt responses and great communication. We had a wonderful August and got to experience the Solar Eclipse at the Astoria Column. This is our 2nd stay at this house and would recommend without hesitation. We walked in and immediately felt at home. The place was clean and cute. We were able to access the riverwalk easily and I even found a great hairstylist within walking distance. The views of the bridge and river were spectacular. The fireworks on the 4th from the top deck were really special. The month just seemed to fly by. Hope to come back in 2019. We are so happy that you enjoyed our house and your vacation! This Astoria rental is perfectly located within easy walking distance to town and most necessities.The view and quiet setting were ideal for the Fall months. The neighborhood offers great access to hike up to the Astoria Column as well. The home is well equipped with all your needs. Patricia was very easy to reach and made the process go smoothly. Hope to come back again in the future. We stayed for the full month of July, 2016, and we enjoyed every minute of it. The house was well-equipped; the decks were enjoyable; the view from the deck outside the upper bedroom was fantastic. We loved the ability to bicycle or walk to restaurants and to the grocery store. After being back in our hometown for a few months, we find ourselves missing Astoria and the house. We hope to be back again.